I've made this twice now, and I love it! I love quiche, which is odd because I don't eat scrambled eggs. I guess I like my eggs cooked longer with no "runny goo." So hence all the quiche recipes I've been posting lately. This one is just as good, and it's meat-free for all your vegetarians out there. I haven't made this one with a crust, simply because it's easier that way, but I would love to, because who doesn't love pie crust? I made this as our main dish last night along with sausage and cinnamon toast, and it was very filling! I actually used 16 ounces of spinach last night where I only used barely 10 the first time I made it. Definitely love the larger amount of spinach. (The picture below is from the first one I made, last night it was much greener!) My boys didn't go crazy over it, but they did try it and eat more so they could get more cinnamon toast. haha Their exact words were, "It's good and it's not good. I don't really know what it tastes like." I keep telling them they are going to beg me to cook all of this stuff for them when they are older. For now, we will keep trying new things and aquiring new tastes. Enjoy! Preheat oven to 325 degrees F. Lightly grease a 9 inch pie,quiche pan, or tart pan. Place spinach in a small saucepan with olive oil and garlic. Cook over medium heat, stirring occasionally until soft. Drain off any remaining liquid. Stir in green onions, eggs, cottage cheese and Cheddar cheese. Pour mixture into prepared pan. Sprinkle bread crumbs on top. Bake uncovered in preheated oven for 45 minutes. Check to see if eggs are set. 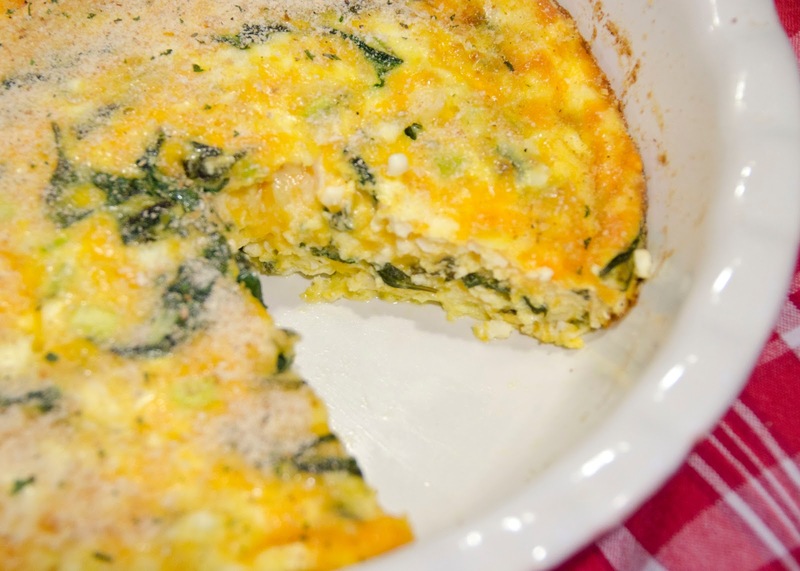 If eggs aren't set, return to oven and bake for an additional 15 minutes, until eggs are set. The baking time will depend on how deep your dish is, so just keep an eye on it after about 45 minutes. I used to make this a long time ago and it was so good! I lost this recipe and have been searching; here it is; printing this right now. Thanks so much! Oh, I love this Quiche! But I'll make it with feta instead of cottage cheese and maybe add some chopped dill.. It looks really good! My baby boy is so used to all kind of "pies" but that's because we are Greeks! Tried your Baha Fish for the first time last night and it was a HUGE hit!!! Hooray! Thanks so much!! I love crustless quiche too. It is incredibly easy to make and healthy too! Well done for making it.